Hell has apparently frozen over – GardenStone Studio in Vancouver, BC, enters the Twin Cities market this spring with a line of CONCRETE containers, benches, birdbaths, pedestals, and wall fountains that are as exquisite as any garden accessories I’ve seen. The big problem with concrete containers and benches has always been, well, the look. 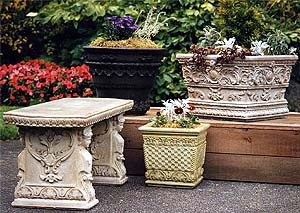 Perfunctory design, limited color pallet, drab finishes, and an overall lack of intricate detail make concrete a poor second cousin to containers and other garden accessories made from terra cotta, iron, and stone. You know, the real stuff. GardenStone Studio is a team of scientists and artisans who are changing all that. The founder and president tinkered with specialty concrete in his garage, mixing up various concoctions until he got it right, then hooked up with sculptors and design artists to create the company. The head designer comes from a Ukrainian family that for generations has created the intricate plasterwork found in museums and palaces across Europe. (His family’s company did the decorative plaster in the interior of Michael Gorbachov’s dacha.) The operations manager brings a background in metallurgic analysis from the mining industry. These guys get the finishes right. Put it all together and their stuff rocks. Not only is the line beautiful, they use air entrainment in all their products, the same process used on bridges to prevent frost damage. They use polypropylene fibers for reinforcement, and silica fume for incredible strength (whatever the hell that is; I’m reading from a press release here). You can leave the benches and containers outside all winter and they won’t chip or crack. Perhaps best, the entire line is mid-priced – it’s concrete, after all.